Here’s a few pictures from this last weekend. I was craving clam chowder so my husband and I headed over to the coast. We’ve gone down to Coos Bay quite a bit, and I love it there, but we decided to drive north this time. I went on quite a few trips as a kid with my family to Yachats and the area, so it was fun to revisit. Going to the coast means two main things: playing on the beach and eating seafood. 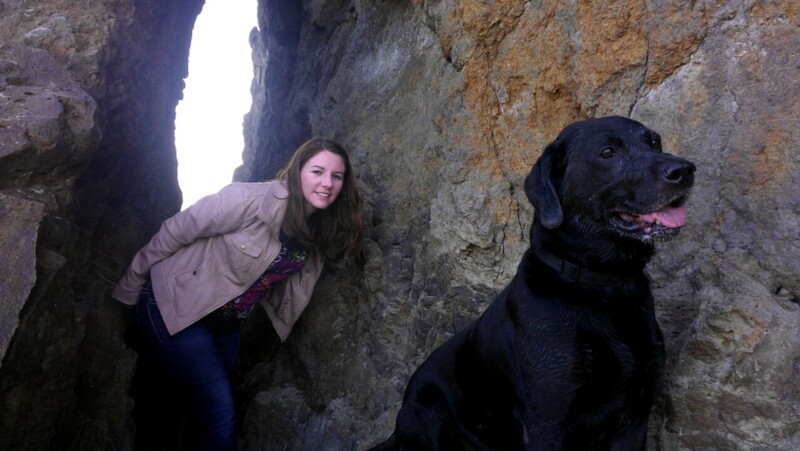 We had chowder, fish and chips and found a new place called Tidal Raves at Depoe Bay. We shared seared scallops and cocoanut shrimp there. I LOVE scallops, and those were the best I’ve ever had. 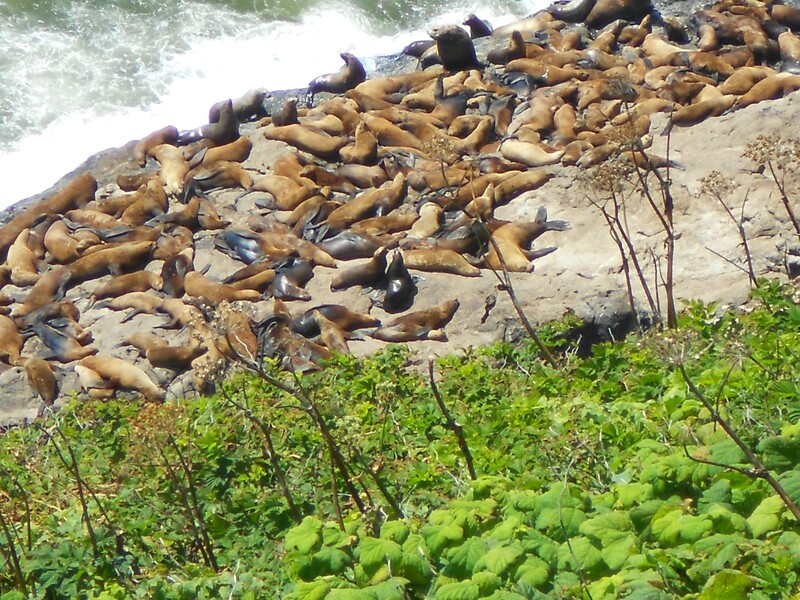 It was snapped from the outside viewpoint of the Sea Lion Caves by Florence. The location has this viewpoint, and an elevator that takes you down 200 feet to sea level to look inside the world’s largest sea cave. It’s usually full of see lions that are busy barking and growling at each other. I took the next picture from inside the caves, looking out over to the Heceta Head lighthouse. We drove north for a while after that and explored the beaches–we found a great little beach that was sheltered from the wind by a giant rock structure. Here’s me with my dog Deco exploring. There are so many special places along the coast. Maybe I can include all of them in a story at some point! Point Hope is out on Kindle and Print! The mighty Pacific has a rugged, rough, unforgiving beauty—like Trey’s life. After an IED brought his Navy career to an end, Trey became an EMT in his hometown of Coos Bay, Oregon. He struggles with PTSD, which affects his ability to do his job and connect with his family. His wife seems to be living life without him. Rosette can’t figure out what happened to her marriage, or to Trey—the man she once so desperately loved. It feels like she’ll lose everything along with him. Meanwhile, he’s enclosed in his own world without her. Their marriage is on its last legs when their family is faced with two deaths and an orphan. They’re already raising two young children and Trey’s teenage brother, Alex. Trey and Rosette make a shaky agreement: to play “family” for now so they can take care of Trey’s recently orphaned niece. But can faking it ever be enough? It’s make-it or break-it time. If they split apart, who will raise Hope? I’m so excited to share my latest novel with you–this is my biggest story yet. Point Hope is my longest novel, has a larger cast and more point of views. I so enjoyed working with the different people in the story, from the main couple Trey and Rosette, to teenager Alex and troubled Summer. Several characters came to life and made the writing even more fun. It was an emotional journey, too, as writing all novels are. 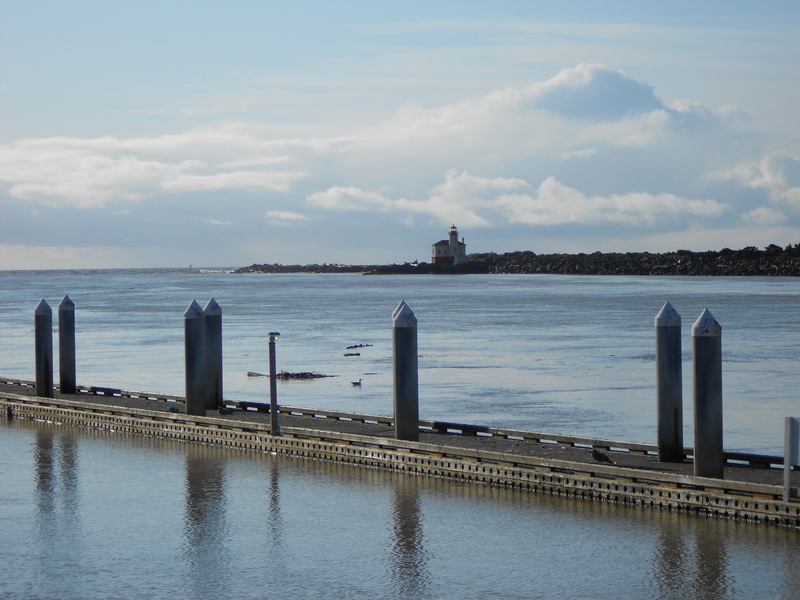 If you’re from Coos Bay or have visited, you’ll recognize quite a few places and landmarks! Rosette awoke to the faint sound of Trey’s cell phone ringing downstairs. Funny how a mother wakes to the quietest noise, even a soft newborn cough. Thank the good Lord they were past those early years with the kids. She rolled over in bed to squint at the alarm clock. It was midnight. Who would be calling him so late? It didn’t sound like he’d answered it, but he could be returning the call. Rosette sat up, feeling alternating chills and waves of heat, as she feathered out the suspicions creeping in. Did he think they’d already severed their tie, and he was now free to talk to other women? The landline phone on the nightstand rang. Her heart skipped a couple beats. Something had happened, she could feel it, but what could be worse than Ricky dying? “Rosette?” a rough voice asked. Harry. Trey’s boss. She said yes again and listened without hearing the rest of Harry’s words before ending the call. OhMyGod OhMyGod OhMyGod. Rosette threw back the covers and ran out of the room, down the stairs, and into the living room, hitting the light switch on her way as she almost charged right into the couch. She startled Trey so badly that he threw up his hands, flinching and turning away. Great. Not a flashback now. She needed him. There’s so much to do and see on the coast, from fishing, clamming, exploring tide pools, hiking, playing on the beach, flying kites, whale watching, to building sand castles. And of course: eating fresh seafood? 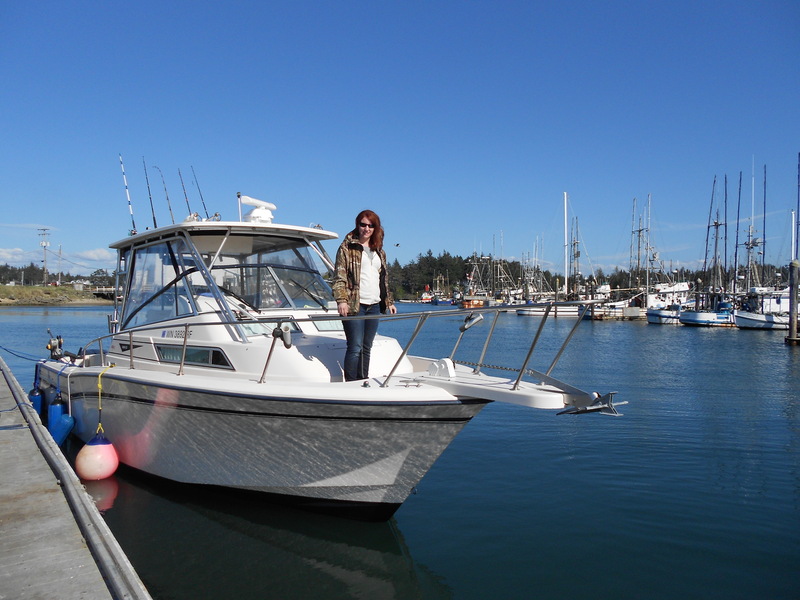 I just made a quick trip to Coos Bay for a day of catching my own fresh seafood. This is looking at the Oregon Coast from two miles out. I’m not sharing it because the picture turned out that great, but because the water is so calm! I couldn’t believe how lucky we got. There are lots of nice days out there, but I plan my trips around writing, life, the kids–you know how it goes! I’ve fished in tall swells with choppy waves, and even caught my biggest fish–a 35 lb salmon–in 17 foot swells before, so it was such a great experience to watch the calm waters, blue skies and occasional cloud in the sky. 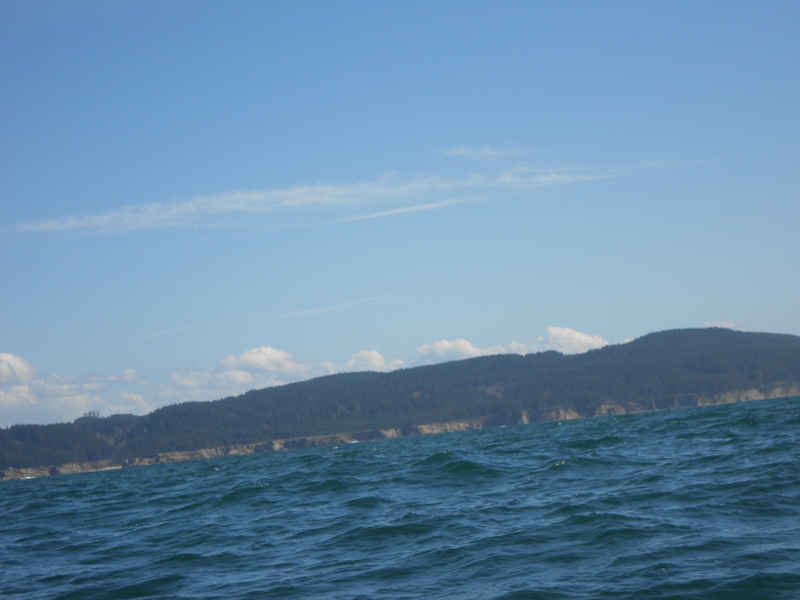 This is also looking back toward where Point Hope is set. The coastline is such a great backdrop for a story, with its beauty, unpredictable weather, storms and mysterious side–I’ll probably set many more novels here! Here I am, hiding in five layers, after our day out on the water. There were several harbor seals playing around the boats, but I couldn’t get them to smile for the camera. One got close enough that I could even see the whiskers on his face, but then he dove. There’s a fish cleaning station a ways off to the left in this picture, so the seals and seal gulls were hanging around over there, waiting for scraps. It’s whale watching week in Oregon, but we only caught a few glimpses of a spout here and there. I did see streams of little jelly fish floating by the boat. We had a great day of fishing with everyone limiting out on ling cod in addition to 3 salmon in the boat. Easter Dinner is going to include some fish this year! 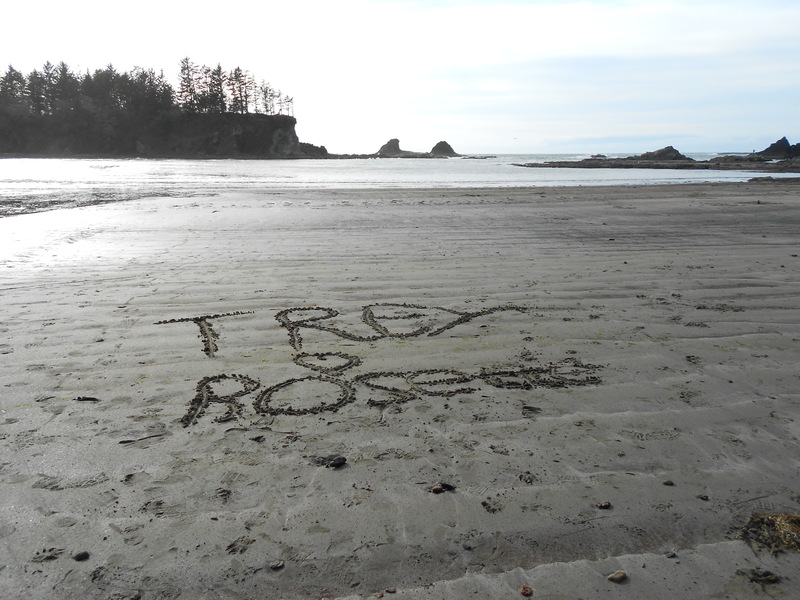 Trey and Rosette Sinclair were once in love. Now they both feel hurt and unwanted. Their marriage is on its last legs when their family is faced with two deaths and an orphan. They’re already raising two young children and Trey’s teenage brother, Alex. Rosette is the mother hen and friend to all. She can’t figure out what happened to her marriage, or to Trey—the man she once so desperately loved. It feels like she’ll lose everything along with him. Meanwhile, he’s enclosed in his own world without her. Trey and Rosette make a shaky agreement: to play “family” for now so they can take care of Trey’s recently orphaned niece. But can faking it ever be enough? Now Available on Kindle! Get it here. Trey held an aged picture in one hand, rubbing a thumb over it. It showed two young boys with dark hair sitting on the front steps together, a yellow lab puppy on their laps—the front half on Ricky’s lap and the back half spilling onto Trey’s cut-off jeans. Trey had wanted the chocolate lab, but Ricky had begged and pleaded for the yellow one. It was a girl to boot, and Trey had wanted a boy dog. A boy like them. But his younger brother had fallen in love with that yellow lab, with her imploring brown puppy eyes, silky soft fur, and tiny pink tongue that licked them both. Marked them both, apparently. Even at that age, Ricky was a people person and knew how to be persuasive. It took just a flash of his little-boy smile, a tilt of his head, and his, “Aw, come on, Trey.” So Trey had given in and let Ricky pick their new puppy, denying—of course—that Ricky had pushed him into it. There had been something special about the way Ricky had looked at that tiny dog and the gentle way he’d held her. They’d named her together: Helen of Troy. It was a strong name, they thought, judging from a movie they’d just watched. Helen had been gone a long time—she’d hailed back in the days of paper airplanes, secret forts, catching snakes, and baseball in the backyard. Now Ricky was gone too. A noise startled Trey, and he slipped the small photo back into his shirt pocket. He looked up as Rosette walked into their home office, noticing it took her a few steps to see him silently sitting in the brown leather chair in the corner. They’d been sharing the office, one person coming in when the other was out. The room had her mark all over it. She’d painted the walls a soft seafoam green. Her pictures and notes for their family history book were spread across their old oak desk. Her light purple sweater was slung over the armchair in the other corner—they’d picked out his-and-her chairs together a good six years ago. His sole decorating contribution was a large, framed photo of the Cape Arago Lighthouse, with the ocean and fiery sunset behind it, which he’d taken himself. Her dark hair was swept over one shoulder and cascaded down, looking like it wanted to curl. That was the usual state of it: doing what it wanted while she always tried to brush it straight. She wasn’t wearing makeup, and her crisp blue eyes and dark lashes looked stark in her pale face. He watched her slack expression stiffen. “Oh.” Her body tensed and she paused, ready to turn around, but something stopped her. Maybe his expression, but more likely it was the new awkwardness they both felt around each other. They hadn’t spoken in several days, except when the kids were present. “Rosette,” he started, but all the words he had been thinking over the last twenty minutes fled his mind. He sucked in a breath as if she’d kicked him in the stomach. The pain was so fresh, raw, alive. “Thanks for that,” he managed. “I was sitting here thinking about tomorrow.” He preferred to say tomorrow instead of the funeral. She gave a weak nod, a half nod really, unsure of what to say. When Trey had learned his brother had been killed in action in Afghanistan, he’d wanted to go to her. Maybe he had. That day was hazy in his mind now. He had wanted to run to her so many times in the days since, but the reality of their situation came back, again and again, like a paper cut popping open. You can almost forget a paper cut until it gets pulled open and the pain shoots back, just like the cut now ripping across his heart. They were still living under this roof together only because Ricky’s death had interrupted their plans. She fidgeted. They both knew they should talk about them­—the divorce—but it was the worst possible timing. He saw the tension in her drawn mouth, the darkness to her eyes, the way she twisted her fingers together. Almost ten years, he mentally corrected himself. Their anniversary was coming up this summer, but it might not mean anything by then. She didn’t answer, and he wondered if she thought his words were yet another jab aimed at her. Honestly, he wasn’t trying to hurt her. It was actually rather ironic—a week ago they’d been stabbing each other with words, and now he was afraid of hurting her. The kids. For Christ’s sake, how could they do this at all to their kids, and to Alex, his little brother? Trey choked down any response to that. Their kids, Candice and Jake, were so young they might not really understand all this, but his brother Alex was fifteen. This had been Alex’s home and family since he was barely walking. He had lost his parents once, and now he’d be losing another set all over again. This is all my fault. Afterwards. The word hung there like a fragile glass ball, waiting to fall and shatter. As much as he dreaded his brother’s funeral, now he dreaded the afterwards even more. Ricky was already dead. And Trey’s marriage wasn’t in the ground yet—it just seemed like it. But he hoped it was still gasping; he was not quite ready to give up the fight. Were you supposed to tell your soon-to-be ex-wife that you were leaving the house? What was the protocol for this? He could have left without saying anything, but that felt rude after she had made an effort just minutes ago. He barely looked at her, but it was long enough to see the fall of her face and the hurt in her eyes. Even with a divorce on the horizon, they had two young children and a teenager to care for, and she expected him to do his part. He was home from work for a few days due to his brother’s death, and the funeral was tomorrow. He went out the back, which just as easily could have been the front because it faced the ocean. His little brother—and only remaining sibling—Alex was coming up the path from the beach. “Hey, Trey.” He had an easy smile, which baffled Trey. Alex took a lickin’ and kept on tickin’. Maybe he was trying to make the rest of them feel better? “How are you doing?” Trey asked, hoping his sincere tone would get a real answer. Things weren’t okay at all. Trey felt even worse. Alex offered a weak smile and headed inside. The kid needed a haircut. His almost-black hair was curling this way and that, down past his eyebrows and over his ears. That would irk their dad to no end if Jonathan Trevor Sinclair II were still alive. As it was, Trey was raising the youngest of the Sinclair boys, and he couldn’t tell if he was doing a good job or not. He sure hadn’t done right by Ricky. Maybe he shouldn’t be leaving. He slowed his step and then heard the back door shut. Oh well. Alex had Rosette to talk to, and they seemed to connect better anyway. Trey walked across the yard to the rough wooden stairs leading down to Lighthouse Beach. 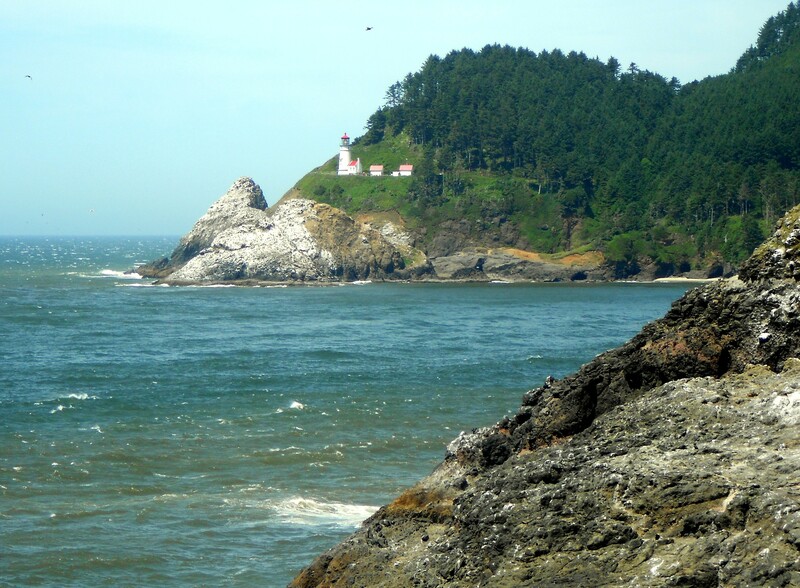 They had a private beach in front of the line of neighboring houses, secluded from the rest of the coastline with Yoakum Point to their north and the Cape Arago Lighthouse on the south side, perched proudly where the land jutted out. He enjoyed walking in their cove, or even further to Bastendorff Beach, if he wanted to walk around the bend. Bastendorff was a public access beach, but it usually wasn’t too crowded, especially this early in the spring. If he really wanted to wear himself out, he could walk the complete length of that beach and continue out onto the jetty. The beach stairs serviced his neighbor’s house as well. He wasn’t surprised when Leena from next door called his name, and he turned his head in time for a quick glimpse before she engulfed in him a tight embrace. He nodded against her head, not shrugging out of the embrace. Actually, he found he’d slipped one arm around her as well. That phrase wasn’t an alarm bell to Leena. It was Rosette who worried about his PTSD when he said things like that. Her enthusiasm for him always left him confused, kind of flattered but overlaid with guilt. He had a perfectly valid reason to want her company right now, but he just couldn’t do it. “I’m sorry, Leena, I want to go alone.” He stepped back. It took great willpower not to glance back at his house for any parted curtains. For a second, he wanted to feel Rosette’s arms around him. Trey headed down the stairs to the beach, where he always ended up. Always escaping, he thought. Today he wanted to get away from death. His brother’s death. His marriage’s death. He wanted to get away from his mixed feelings about Leena. He didn’t think any of those thoughts would have invaded his mind without her flirting. It wasn’t like he’d been having sexual fantasies about her. Instead he found himself thinking about her company—just talking with someone without all the complexity of his other relationships. From down on the beach, he could see his renovated farmhouse up on the hill, its warm yellow glinting through the trees. Leena’s house was mostly hidden from this viewpoint. He tried picturing a different life, but it was fuzzy. Yet that was the reality: his brother was gone, his wife was probably leaving him after the funeral, and he might lose his family home. Trey had no idea how he’d even gotten to this point, so he turned his attention back to the physical world around him, something that didn’t slip away. It was a quiet spring day, calm for the beach, with not too many people around. Of course, the beach was big enough that you could be alone even with other people around. The colorless sky was thinking about raining, with gray clouds that lightened toward the horizon. But he had the feeling it’d hold off for a while. The water called to him today. Sometimes he meandered along the inland edge of the beach, close to the Scotch broom growing profusely on the bank, but today he headed straight down toward the ocean. The tide was in, so he didn’t have nearly as far to walk. 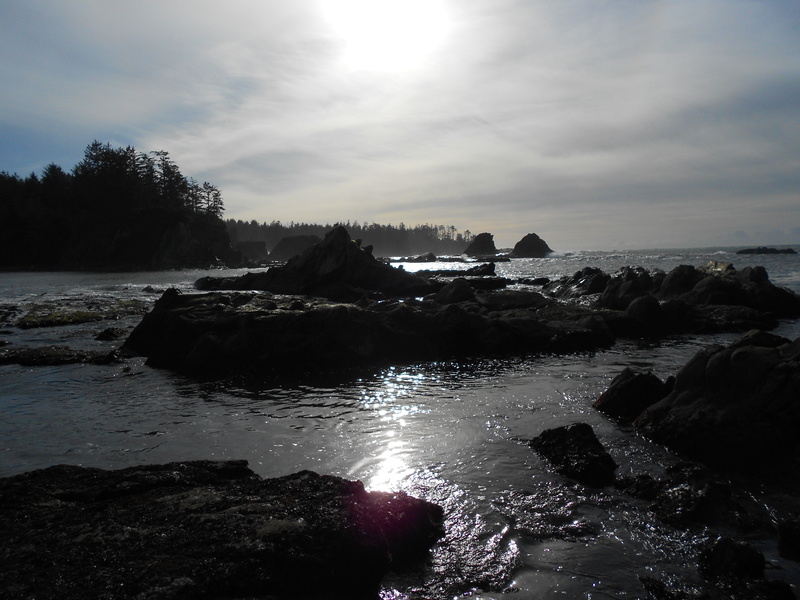 He always viewed the mighty Pacific as having a rugged, rough, unforgiving beauty—like his life. He thought of his wife and wondered, yet again, why he didn’t feel in love with her. Back in high school and the first year in the Navy, he was ready to tackle life. Everything waited for him. She waited for him. And he came back home and romanced Rosette. They had grown up together here, but when he came home and saw her, it was love at first sight for both of them. All the excitement had faded since then, during his time treating wounded Marines. He’d seen the ugly side of life and what people can do to other people. Then, when he was counting down months until he’d get out, he was wounded. They were close by when an IED took out one Marine and wounded another. The shock. Even as a Corpsman, it was still an awful shock to see someone’s flesh opened up, torn apart… He’d reached a point where he saw it and put the shock away for later. They’d had to in order to stay calm and treat the wounded. That’s exactly what they were doing with a second IED triggered. Hot metal ripped all through him. But he was one of the lucky ones. He was so close to the blast that it gave him a concussion, knocking him unconscious. A gift from heaven in that situation. He’d finally healed on the outside. Only scars remained now: white tears in his skin, like tally marks. Maybe he had one for each life that was lost under his team’s care. 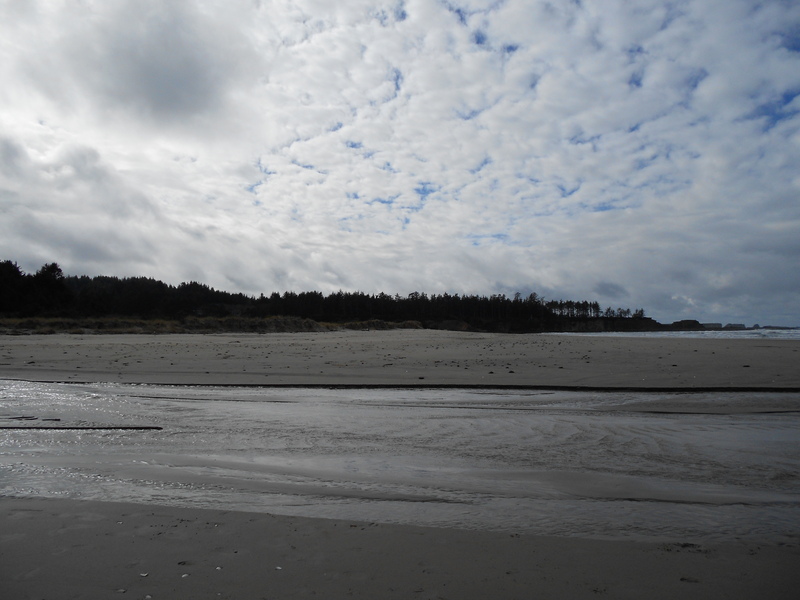 Salty wind blew sand into his face as he hiked around the rocky bend to Bastendorff Beach. You learn to live with the taste of salt on your lips on the Oregon coast. It was home to him. At least that wouldn’t change. The rest of his life was another story. Within the span of two seconds, her face went from shock, horror, and hurt to plain angry. She’d turned on her heel and left the room in three steps. It was late afternoon, and the kids were home from school. Rosette might have been hiding in their bedroom or taking a bath; he wasn’t sure, so he made peanut butter and jelly sandwiches for the kids and sat at the counter with them, talking about their day. It was perfectly normal and routine except that everything was falling apart inside him. When he’d heard her moving around upstairs, he kissed the kids on the head and told them he had to run some errands. He waited until eleven that night to come home and slept on the couch. She woke him up in the morning by standing at the far end of the couch, where his feet were uncomfortable wedged against the armrest, staring at him. Now he couldn’t figure out which end was the carriage and which was the horse. Did she want a divorce before he had asked? Or did he plant the idea? Did she really want to split up? Did he? She had walked away after her declaration. He got up, showered, and tried to eat breakfast so he could talk to her without getting too upset. It seemed to him, even though they were to this point, that they should discuss it rationally. So he’d found her sitting in the office, staring at the papers and pictures on the desk. He stopped in the doorway and leaned on the doorjamb. She turned her head a bit toward him but didn’t look at him. Apparently it was his job to begin. The phone rang, startling them both, but they ignored it until it stopped ringing. A couple seconds passed, and his cell phone rang in the other room. He debated if he should answer it for too long, and it stopped. The landline started ringing again. He grabbed it, saw Sinclair on the Caller ID, and still barked hello, knowing it was his sister-in-law. “Tre-ey-yy,” Amanda sobbed his name into three syllables. He didn’t panic right away, but instead slipped into EMT mode, pulling up his soothing voice. He visualized the two Marines in front of him, in full dress uniform. The horrible news hit him. It reflected in his wife’s eyes. Ricky should be coming home from deployment in mere weeks—in time for his first child’s birth. Not this. God, not this. There were sparks in front of him, like Fourth of July sparklers, and Rosette’s voice mixed with Amanda’s crying. He even heard himself telling Amanda everything was okay (how was it okay?) as he fell back against the wall and slid down to the floor. Was that only a week ago? A week since his brother died and his wife asked for a divorce? Trey stopped at the end of the jetty, startled to find himself there. For the life of him, he couldn’t remember turning onto the jetty in the first place. The ocean moved on both sides of him, slapping the rocks. It was time to turn around, or past time, but he kept watching the waves reach up and the sunlight turn the water green; then each wave would crash with magnificent anger onto the sand. Rosette paused in the middle of the walk-in closet, looking down at the dusty suitcase. She’d walked in here at least ten times and stared at it, thinking about picking it up and packing. That was before they’d gotten the call about Ricky, of course. Once that happened, she knew she couldn’t just up and leave. But who was she kidding? There was no way she could simply pack a suitcase and solve things. What would she do, pack up the kids and take them with her? Leave them here with Trey? How would she explain all this to them in the first place? She batted a tear off her cheek and set her mouth. This wasn’t a time for weakness. Instead of giving into the tears and the urge to crawl into bed and hide, she impatiently pulled her black suit off the hanger and got dressed for the funeral. When she left the bedroom, the house was quiet. No TV. No fighting kids. No teenager talking on the phone. The silence gave her the heebie-jeebies. She wondered if everyone was outside, but as she walked down the hallway, she saw Candice and Jake playing together in Jake’s room, dressed in the church clothes she’d laid out last night for them. Even with the door open, they weren’t making any noise. Though Candice was seven and Jake was five, they were the same size. Jake wasn’t overly tall for his five years, but Candice had always been small because she was born early. With the same dark hair, they looked like twins. Watching them made her heart warm with love and pride, but it was tinged with the pain of knowing the recent deaths had already eroded their innocence, and now she was thinking about splitting apart their family. Rosette had painted Jake’s room blue, and Trey had picked out the sports-themed accents. It’d really touched her when Trey had joined in and taken such a big part in decorating. Candice had a light pink room, dotted with Precious Moments figures, but she would have probably preferred an outdoor theme, if she’d picked it out herself. Rosette hadn’t planned on such a free-spirited, nature child—not that she’d change her daughter for anything. She didn’t pause long enough in the doorway to see what kind of game they were playing. There was a jumble of action figures and Barbie dolls on the bedroom floor. Somehow they knew to get along today. They didn’t notice her, so she left them alone and started for the stairs. She found Alex downstairs, sitting on the sofa in the living room, bent over with his elbows on his knees, his face in his hands. He was staring at the big window, but he wasn’t looking at the view of the ocean. He wasn’t even there, not mentally. Trey was nowhere to be seen. Must be nice to be numb all the time. She was drowning in emotion and felt pulled away from the kids and Alex, and certainly Trey. How could she help any of them while falling apart herself? They had an hour till the funeral. She poured another cup of coffee, stared at the breakfast dishes, and thought about all the things they’d need to do later today and this week. Well, at least a list was something she could manage. This could have been any Saturday on the calendar, but this one would stick in Trey’s mind for a very long time. The rain still hadn’t come, as if the sky were holding its breath along with him. What they were waiting for, he wasn’t sure. There wasn’t going to be a phone call announcing that it was all a mistake, that Ricky was alive and well. Trey and Rosette sat on the padded church pew with Candice and Jake between them. Alex sat on Trey’s other side, looking down. They surrounded Amanda along with her close friends. Summer, Amanda’s sister, sat rigidly on her right side. The two looked so much alike with their golden hair and sweet faces. They didn’t both inherit the same sweet personality, however. Summer might as well have been named Trouble. Not that Trey’s life was perfect, not by a long shot, and he hated passing judgment on people. He might not be a hellraiser, but he was on the brink of letting everyone down. Maybe he already had. As far as he knew, no one else was aware of their marriage problems and especially not the recent divorce development. That almost didn’t matter today. He looked at his pregnant sister-in-law, dressed in black over her swollen belly, and once again wondered how life could be so cruel. What would Amanda do now? And Ricky. What would they do without Ricky? He and Ricky had always been rivals. Trey was the firstborn, Jonathan Trevor Sinclair the third, so his little brother had always felt second best. It wasn’t the truth. Sometimes Trey felt like he had to be upstanding and responsible while Ricky got to be fun. Ricky was contagious—people inherently liked him. Trey and Ricky were teenagers when their parents had had a surprise third baby. Their brother Alex was almost like a nephew to them. Life was good until their mom died. Later they lost their dad too. He’d give anything to have his parents here with them. On the other hand, it’d break both his parents’ hearts to lose Ricky and to hear how Trey’s life was turning out. Maybe it was a blessing that Mom and Dad weren’t here for this. Now Ricky was dead, and Trey’s life was a mess. One of the most fun aspects of being an author is stepping into the world of my characters. Trey and Rosette from Point Hope live in an old family home overlooking the Oregon coast. This weekend I walked on “their beach,” drove on their road and through their town, thinking about their story, their home and their lives. It surprised me just how powerfully I felt the connection they would experience between their family, traditions and home. Everywhere I looked, I was reminded of different family trips and special moments from my childhood and from trips with my kids. This weekend we were having a great time with our six kids, playing on different beaches and going to our favorite restaurants. I have to agree with Trey – spring and autumn are awesome seasons on the beach. It’s not as windy as in the summer and there aren’t nearly as many tourists. (Although the local economy probably loves the summer crowd!) We enjoyed two days of great weather, with sun and clouds but not rain, and just a hint of wind on the beach. The kids had to run to keep the kites up in the air! Here’s a few pictures from the beach as the clouds broke up, making it seem almost like a moonscape in some shots. I recently drove over to the coast for the weekend despite a forecast calling for rain. It’s raining here, and usually raining there, so we decided to give it a try. We got so lucky! The sun came out the second day, and we had great weather for spending several hours in the West Coast Game Park, about 7 miles south of Bandon on HWY 101. If you ever visit Bandon, Oregon, you must visit the Game Park! 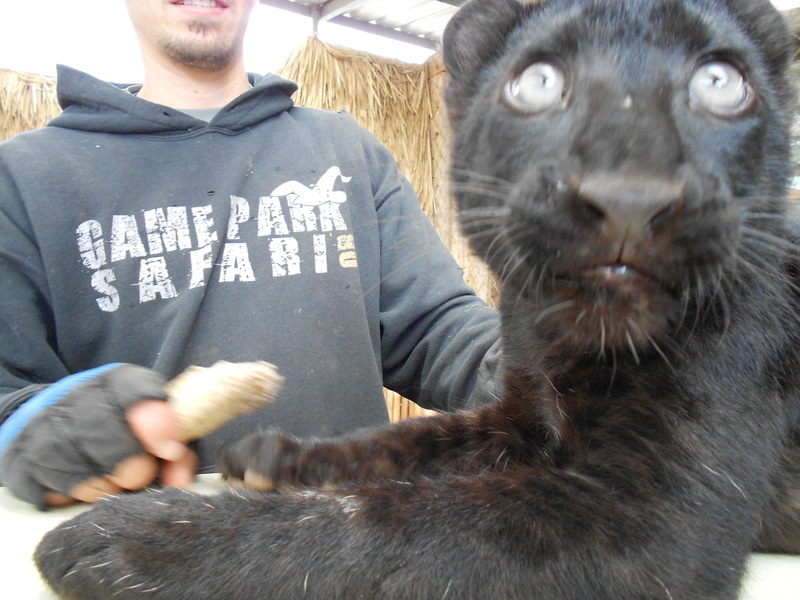 They usually have some kind of babies that you get to pet, and we played with a lion cub and a spotted leopard. This isn’t zoomed in; my daughter took this at the rail where the handler brought the leopard by everyone for pets and pictures. This is the evening sky in Bandon, Oregon. 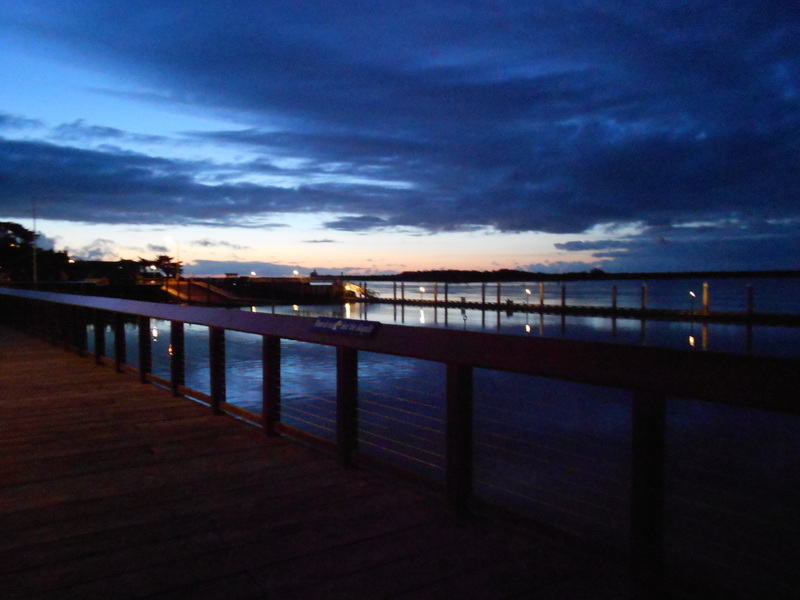 Bandon has the board walk, a variety of seafood restaurants, the Fudge Factory and Cranberry Sweets, which sells all kinds of jellied cranberry and other berry treats along with chocolate galore. This is the lighthouse you can see from Bandon. There were also seals playing in the water as we watched. We actually saw two different lighthouses on this trip. After visiting Bandon, we drove north to Winchester Bay and Salmon Harbor. From the viewpoint right off HWY 101, we could look down to the Umpqua Lighthouse and where the Umpqua River meets the Pacific Ocean. It’d been raining buckets for some time before our trip, so there was a huge brown cloud extending out into the ocean from the river. 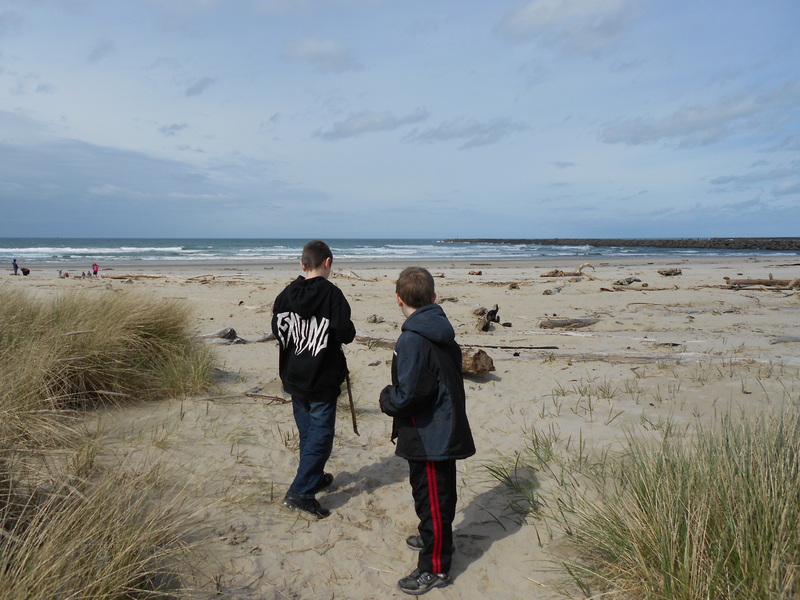 We live along the Umpqua River so it’s neat for the kids to see how and where it connects to the ocean. One of the best parts of visiting the coast is always gazing out at the ocean and feeling how huge it is – even if you go every year. Or more often. It can be very temping to take off for the coast when you see it’s going to be sunny there that day. Sometimes the best weather is a sunny day in the spring or fall when the winds aren’t as strong as they are in the summer. And finally, the beach.This is where we go most often to play on the beach, although we love quite a few places all along the Oregon coast.There’s just something magical about going to the beach, playing in the waves and sand, and maybe finding treasure. .. or at least some cool shells.